Personalised jewellery has entered the trend once again as one of the most sought-after gifts, more than a Silver or Gold accessory, it’s a piece of jewellery that carries significant meaning for the wearer. Show your loved one just how much they mean to you with personalised jewellery, a sure bet that it will be a piece that they will treasure forever. So when did personalised jewellery first enter the scene? Well, the art of engraving and personalisation has been used to honour gods and rulers, to signify wealth or a symbol of affiliation to ethnic, religious or social groups for many years. Personalisation and engraving is an old tradition, beginning half a million years ago. Since civilisation began, engraving has been a practice that has been used for many many years, with some of the earliest examples discovered in the beautiful etchings upon cave walls once used to tell ancient stories and legends. In Greece and Egypt carvings into gemstones, known as cameos, have been discovered to depict old leaders, dating back to the 5th century BC. As the technique of engraving developed, artisans began to etch decorative personalisation into metal. This type of metal engraving became increasingly fashionable in the 15th century when coats of armour and shields were embellished with the family crest, to swear and mark their allegiance and loyalty to their side. What kind of personalisation has there been on jewellery? Personalised jewellery has also been engraved with many kinds of decoration, from monograms and seals to elaborate designs for almost as long as jewellery has existed. As the technique of engraving to personalise jewellery evolved, the skills became ever so valuable, and by the Renaissance, hand engraving became a secretive art. The skills would be passed down from master to apprentice, continuing the fine engraving technique through the years. Such closely guarded skills survived into the industrial era only to be threatened once again by mass production. Personalised jewellery as we know it today, has been engraved by everything from simple inscriptions of names and dates to more elaborate embellishment and texturing techniques, a tradition that traces back to the old world of Renaissance goldsmiths. Personalised jewellery is a significant part of the history of jewellery in Britain, with the Victorians taking symbolism and personalisation of jewellery to a whole new level. The early Victorian era was the first to be profoundly influenced by romanticism, reflecting the general love of the nation for its young queen and her love for her husband, Prince Albert. The romance and love were captured in the personalised jewellery from this era, with the swallow bird being a universal symbol in compassionate Victorian jewellery tokens. Repousse was a favourite metal work technique of the period, which involved hammering malleable metal into elaborate designs and patterns. Jewellery aficionados arranged gemstones into settings so that the first letter of each gem spelt out an endeared word for a loved one. A hidden message so beautifully assembled can be much admired as the unique way in which Victorians personalised their jewellery. Stunning hand engraved monograms was a passion among Victorians, featuring strongly in jewellery designs and was often used as a status symbol. Members of the Victorian era aristocracy used monograms as an emblem of their royal status. Initially, early monograms consisted of two letters. During the Victorian era, there was a slight shift with traditional monograms including three letters. There were strict standards imposed for the form of the monogram. Married women’s monograms were to include their first initial on the left, their middle initial on the right and the last initial, the initial of their married name was to be placed in the middle, larger in size, framed by the two outside smaller initials. The interlocking monogram has long been a feature of personalised jewellery in our British heritage, a design with high elegance that is timeless, and it is no wonder that we have seen such revival of this design in our jewellery in more recent times. At Bianca Jones Jewellery some of our best selling gifts are from our personalised jewellery collection. Why not follow suit, and as the traditional Victorian-era choose monogramming as a way to engrave a necklace or bracelet? Choose a single initial, perhaps the wearer’s initial or your own, so they are reminded of you each time they wear it around their neck. The Initial Necklace is a favourite personalised piece of jewellery for new mums so that they can carry the initial of their new little one with them always. Inspired by the traditional monogram, our Double Initial Necklace, has two interlocking initials engraved to personalise your jewellery. This piece makes for the ideal gift between two best friends or a beautiful gift for a girlfriend, get yours and hers initial embellished in the Victoriana style scrolled engraving. Also for newlyweds, symbolise the unity of two people with each of their first initial hand engraved and interlocked together, to resemble togetherness forever. Alternatively, treat your wife or friend who is a mother of two, and get each of her little ones’ initials marked on a necklace or bracelet so that they can carry their loved ones with them. Or if she has three children, we have just the answer with our Triple Initial Necklace. Or if this is a treat for yourself or a friend, why not get the initials of yours or her full name personalised on the necklace, a timeless piece that goes with everything both for every day and sophisticated evenings. A new option from our personalised initial jewellery collection is to have the back of the disc of your Necklace or Bracelet also engraved. Giving an opportunity to have a slightly longer message or date hand engraved. Commemorate a special date, be that a birthday, wedding date, the birth date of your child, graduation or simply a day that holds a special place in your memories to your or the wearer. Please do contact us for any further special requests about hand engraving, so that you can create your very own personalised jewellery. Our personalised jewellery collection goes beyond hand engraving, with our Birthstone and Diamond Initial Necklaces or Bracelets, you can further adorn your piece with a sparkly personal touch. A firm favourite personalisation is to have the birthstone of the wearer embellished alongside their initial. A truly meaningful Necklace or Bracelet for any special occasion, to remind them just how vital they are to you in your life. Birthstones make for the perfect personalised jewellery, and with such a classic and timeless design, they are sure to fall in love with this gift, ideal to wear every day or saved for special occasions. Read more about the meaning, myths and legends behind each month’s gemstone on our blog. Wear your personalised necklaces with other jewellery. Why not layer a few necklaces together, or keep your look clean with a single strand and multiple pendants. Our Double Disc Collection showcase some elegant personalised pendants that can be doubled up for extra delight. 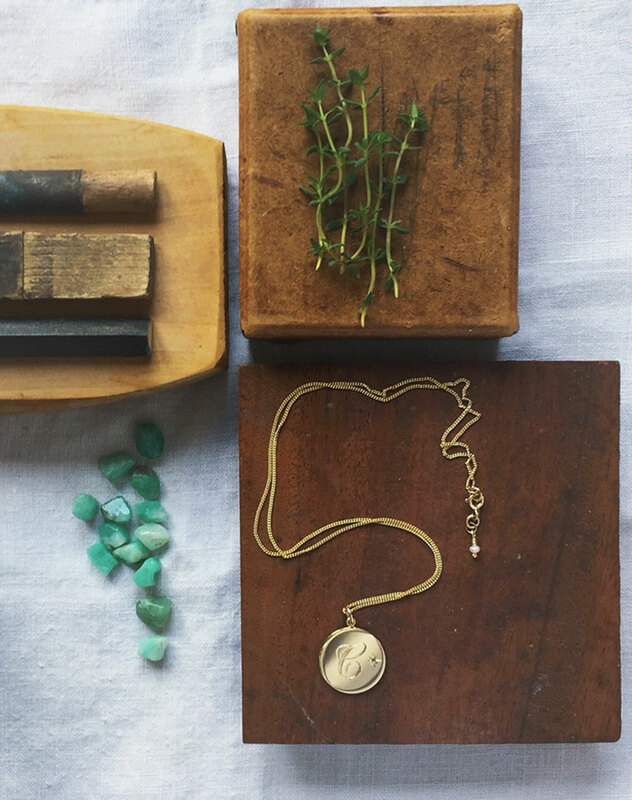 For example, if you still like the idea of monogrammed jewellery, then our Double Disc Initial Necklace or Double Disc Birthstone Initial Necklace is just the answer. 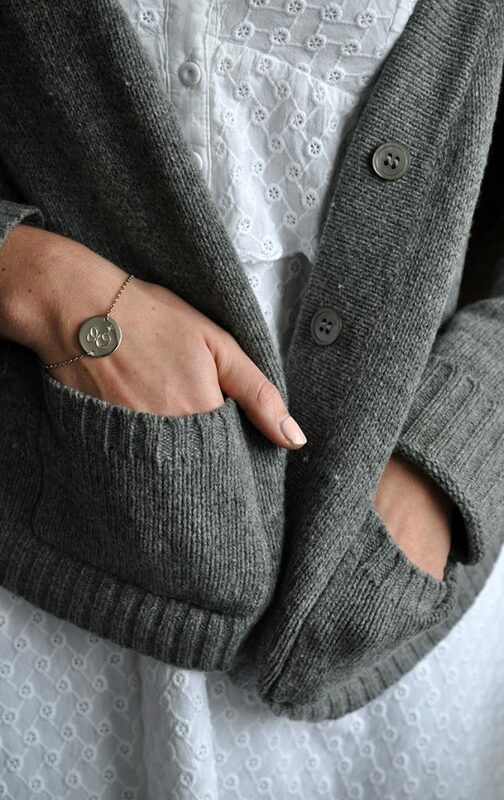 Each disc carries an initial important to you or the wearer, a popular personalised jewellery choice for mums. For something a little more unique and different from the traditional and classic monogrammed pieces, our Double Disc Latitude and Initial Necklace is just the thing for you. With one disc hand engraved with an initial of your choice, the other hand engraved with latitude and longitude coordinates of a particular location chosen by you. Your first home, the place of your wedding, your honeymoon, your favourite holiday destination, your most loved picnic spot or place to relax on a summers day. The fact that these individual coordinates have been determined by the starry heavens above makes the marking of this location all that bit extra special. If you have any queries about these unique personalised pieces of jewellery, then drop us an email, and we will do our best to help you. 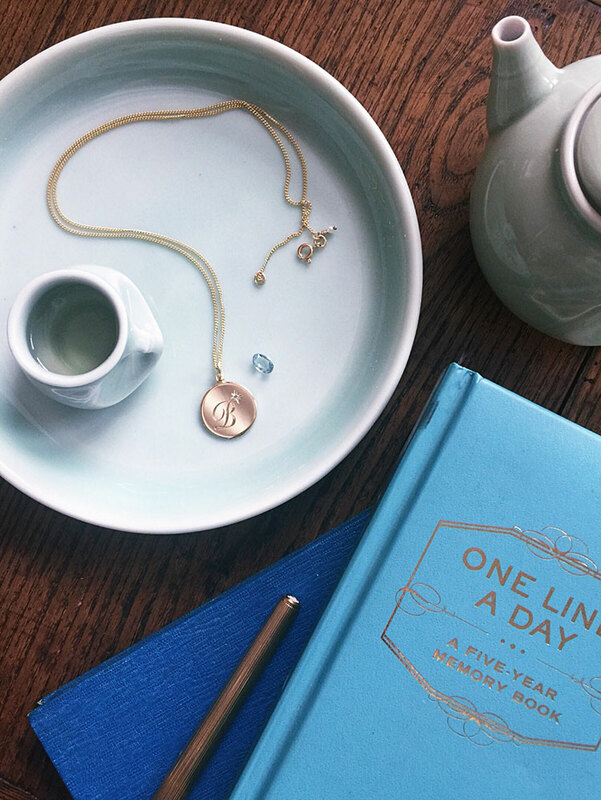 Create a loving memento to carry close to the heart with our personalised jewellery. In a necklace or bracelet, in any of our precious metals to suit any preference. Each of our pieces is available in sterling silver, 18ct Yellow or Rose Gold and solid gold. Arrived on time and she loves it. Just received my ‘Forever Lucky’ Necklace it’s absolutely gorgeous and I even better than I expected! The detail on such a tiny piece is stunning I’m made up. Thank you so much, truly talented! Have got my eye on the gold dragonfly next, I was torn!